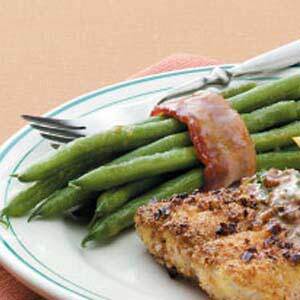 Fresh green beans are wrapped in bacon and covered in a sweet sauce in this fast and simple side dish. Every time I take these green bean bundles to a luncheon or family dinner, people beg me for the recipe. Drain beans; depending on the size of the beans, place about 8-12 beans on each bacon strip. Wrap bacon around beans and secure with a toothpick. Place on an ungreased baking sheet. In a small bowl, combine the butter, brown sugar, garlic salt and soy sauce; brush over bundles. Bake at 400° for 10-15 minutes or until bacon is crisp. Yield: 4 servings.